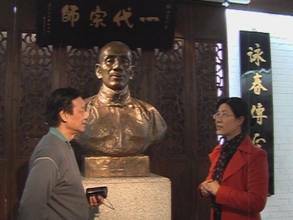 The writer is an instructor of Ip Man wing chun who travelled to Fut Shan to discover how the Ip Man Museum came into existence by having an interview with the deputy curator of Ip Man Tong, Miss Wong Hung. Fut Shan or ‘Buddha Hill’, 20 kilometers from Kwong Chow(Guangzhou or Canton)’ is the home of Wing Chun. You would wonder why. 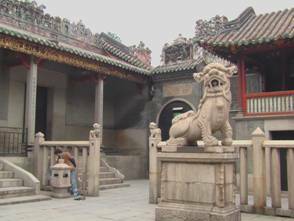 Fut Shan (Foshan) has a recorded history dating from 628 AD in the Tang dynasty. It became famous for its ceramics, silk, metalwork and woodcarving as well as herbal medicine. The wealth of the city created wealthy merchants. According to the national trait of the Chinese, the wealthy tended to enhance their prestige by hiring a famous martial artist in residence for protection as well as to teach their children the fighting skills. A call by the wealthy would attract all top-notch martial experts from the four corners of China. As a consequence it is no surprise that the three most famous Chinese fighting systems practised around the world came from south China, specifically from Fut Shan. 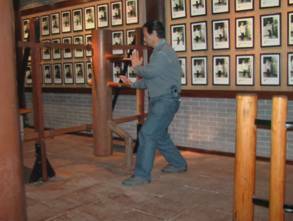 These are Hung Kuen, Choy Lee Fut and the unique Wing Chun. They were martial arts created elsewhere in China but nurtured and blossomed in Fut Shan. It is commonly accepted that Wing Chun kung fu is one of the most popular Chinese martial art now practised around the world. The two sons of Ip Man, Ip Chun and Ip Ching, now in their seventies and eighties, recognised the global recognition of their father’s contribution to the world of Chinese martial arts. They made a series of visits from Hong Kong to Fut Shan to meet with the Councillors of the city’s Cultural Council to discuss the worldwide influence of Ip Man’s Wing Chun. They agreed that his teaching had spread from China, through Hong Kong and then the world and had earned recognition in its home town. The Ip Man Tong Development Council was formed and fund raising was started. The Agreement was signed between the Cultural Council of Foshan and Ip Chun and Ip Ching on behalf of Ip Man Tong Development Council in April 2000. Jo Miu was the first temple built in Fut Shan in 1078-1085 and thus described as the Ancestral Temple. It is a large complex which also contains the theatre for performing opera, of which Fut Shan is considered the birthplace of Cantonese Opera. Hung Kuen kung fu is also represented here with their museum to Wong Fay Hung. 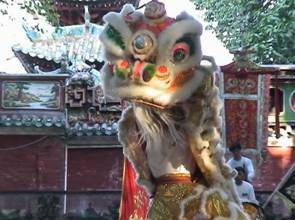 The disciples frequently display lion dancing and martial arts in the vast courtyard. Material for the buildings came from local industries including the glazed roof tiles with assemblies of frolicking lions and characters from local tales made in Sai Wan, the famous ceramic production centre on the outskirts of Fut Shan. I was shown a garden in Jo Miu in 2000 purported to be the site of the memorial structure. I later learned that the structure envisaged was too small and insignificant to be worthy to represent the enormous international cultural heritage as Ip Man’s Wing Chun. Subsequently, the impetus to find a location faltered. The project remained in limbo until 2001 when Samuel Kwok visited Fut Shan with a large group of students to train with Ip Ching. During their stay they visited Chairman Leung of the Fut Shan Jo Miu Committee. They discussed the lack of progress and Ip Ching proposed a temporary site in the interim. The next day the Chairman met Ip Ching and Samuel Kwok on short notice. The Chairman agreed that Ip Man’s teaching is so widespread it had to be recognised. The recognition can affect the fame and tourism of Fut Shan. 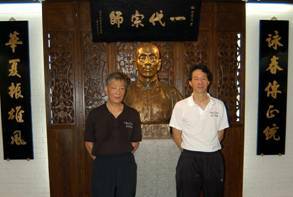 In late November 2001, Ip Chun and Ip Ching representing the Ip Man Tong Development Council was invited to Fut Shan to discuss an appropriate location within Jo Miu to build the Ip Man Tong museum and then a date of 9 November 2002 was given as the official opening. Amidst great fanfare Ip Man’s followers from all over the world were invited to celebrate this auspicious inauguration to commemorate that great man of wing chun, Ip Man. Ip Man came from a wealthy merchant family in Fut Shan. Through the political upheavals in China he was obliged to leave Fut Shan and started his new life in Hong Kong in 1950. He had few possessions on arrival at his new hometown and did not prosper in the teaching of martial art. Fortunately for his descendants there are a few treasured relics left by the great man to remember him by. Most of the personal mementos were kept by his son, Ip Ching, in the same apartment that Ip Man lived in before his passing in 1972. A major link that the descendants have to share with this great man was a movie film that he made weeks before he died. In it he performed the Siu Nim Tau and Chum Kiu hand-forms. He knew his end was approaching but his determination and strength to perform came through in the film so that posterity would have a factual reference to his teaching. At that same time he was also filmed performing the wooden dummy or the Muk Yun Jong. The Jong Fong or Wooden Dummy Chamber is on the right side of the museum, leading from the entrance hall. On the walls on each side of the chamber hang the hundred odd photographs of Ip Man performing every move of the wooden dummy set as performed in the Ip Man system. Switch on the overhead projector and one can watch Ip Man performing the Dummy Form. To reflect the age of the film and the technology of amateur cinematography at that time his moves were jerky like the old Charlie Chaplin movies but unmistakable and precise nonetheless. Together with the Siu Nim Tau and Chum Kiu hand forms, the film of the three forms together have been commonly referred to as the ‘8 Millimetre Movie’. As this film recorded Ip Man’s last thoughts and testimony it must be considered that his presentation was his last review of his teaching of Wing Chun during his lifetime. In an opposite alcove, stood the original wooden dummy that the Grandmaster used in his training. It was donated by Ip Ching where it used to stand in his apartment, the same where Ip Man used to live in. On display with the wooden dummy in the alcove is an exact replica of his pair set of Bart Jarm Do or Eight Chopping Knives, which are a pair of cutlasses made of stainless steel and a replica of a long wooden pole or lance which is eight and a half feet long ( 2.60M) called Luk Dim Boon Guan or Six And A Half Point Pole. In one of the display cases are three books made from the traditional rice paper. One book is on General Medical Cure, the other is on Cure of Complex Illnesses and the third is on Dim Muk or Death Touch. The hand-writing is by no less a person than Dr. Leung Jarn who was the oldest traceable historic ancestor of Wing Chun kung fu. Again, the fact that these books were inherited by Ip Man from his teacher Chan Wah Shun who in turn inherited them from the Doctor shows the esteem he was held by his teachers. The book of Dim Muk being in the possession of Ip Man should dispel any belief that death touch is not known by Wing Chun practitioners. As a matter of fact, if one examines some of the techniques in the third form, Biu Jee, one should identify the function of some of the moves for this intention. However, in conversation with Samuel Kwok and Ip Ching, they explained that Ip Man did not place strong emphasis on the deadly moves in the forms to avoid fatalities or crippling injuries to life to those at the receiving end. This reflects the morality of that gentle person and the humanitarianism in his soul. These original books were also donated by Ip Ching from his inheritance. 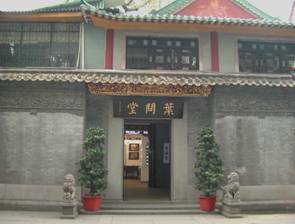 The site of Ip Man Tong was previously the home of a resident in the grounds of Jo Miu. The renovation work was closely supervised by the Foshan heritage department from the inception of the design by the architects to the final reconstruction. The panels and carvings were in harmony with similar Ching period architectural decor in other buildings on the grounds. 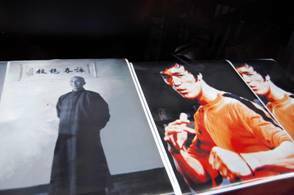 Black lacquered picture frames displayed the many memorable photographs of Wing Chun practitioners from Ip Man’s first students to the international followers in far flung corners of the world. The main hall was appropriately named as Ip Man Tong. It was dedicated to Ip Man and his lifetime. It represented his martial art, his family and the legacy of his teaching. Overlooking the room from a commanding view was a bronze bust of Ip Man. Miss Wong said that it was recreated from photographs but the working mould was meticulously and constantly reviewed by the two sons, Ip Chun and Ip Ching, during the sculpting stage bringing out the character and spirit of their father. The immediate adjoining room was dedicated to his direct students. 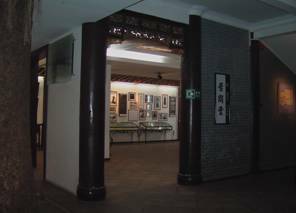 The photo gallery along the walls included photos of his two sons, Ip Chun and Ip Ching, displaying their skills of Wing Chun. There were also photographs of his first students Kwok Fu and Lun Guy who are now in their eighties. On a panel we can see action photos of a very young Bruce Lee matching skills with his equally young teacher, Ip Man. There were other notable students as well like Chu Sheung Tin, Wong Shun Leung, Chow Tze Tsuen, Chiu Wan, Lok Yiu, etc. The third room was dedicated to the second generation and beyond. It was here that we can see how widespread Ip Man’s teaching has influenced martial arts around the world. 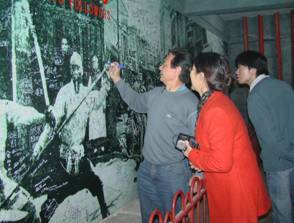 This fact was also shown on a lit map hung from the wall showing dots and patches where Wing Chun has made its mark. Photographic record of Wing Chun practitioners of all shapes and colours displaying their martial art moves and proudly gathered around their sifu in group photo for the album. On the way out one passes the corridor of memories. On one wall in the corridor leading to the exit is a 10 metre long life size mural of a street scene from the Ching period imprinted on the plaster wall. This photograph is a very appropriate image of how Fut Shan probably looked like at the time of Ip Man’s youth and perhaps not far from the days of Leung Jarn as well. Visitors can endorse approval of the museum before they go home by signing their name on the mural. 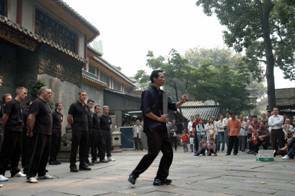 They would have paid their tribute to the memory of the great man, Ip Man, at Ip Man Tong. The First Conference in November 1999 saw a congregation of close to a thousand participants from all over the world merging into Hong Kong and then the onward journey to the home of Wing Chun, Fut Shan. The two sons of Ip Man, Ip Chun and Ip Ching, showed their intimate knowledge passed on to them by their father and talked about their father’s effort to promote Wing Chun. Second generation students also displayed. 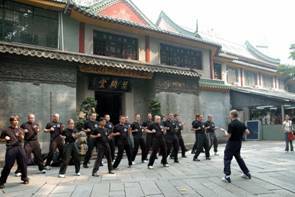 26 to 29 November 2005 - have been set by the executive committee of the Ving Tsun Athletic Association as the date for the Second World Wing Chun Conference. It will take place in both Hong Kong and Fut Shan. Persons interested can contact VTAA in Hong Kong for more information and bookings. You are advised to make your arrangements as early as possible as a large number is expected at this Conference.